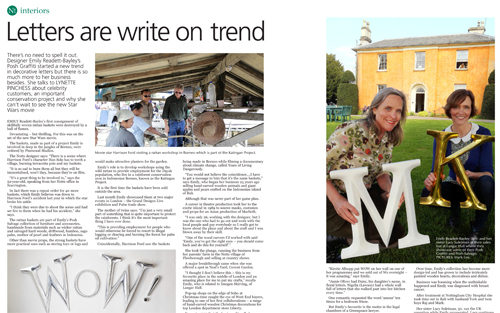 Emily Readett-Bayley produced her first hand-carved wooden lettering in 1990. She went on to sell her designs to retailers around the world and launched POSH Graffiti online in 2007 with her sister Lucy. Today POSH Graffiti still sells lettering and typography designed and manufactured by Emily Readett-Bayley Ltd and the Indonesian craftspeople they work with but the website is now managed by Jason Weatherbed who takes over POSH Graffiti. He intends to add new POSH Graffiti related product ranges to Emily's original collection and build on her lettering legacy. Emily has always taken care to source sustainable materials and for many years has pioneered the concept of stylish design with an eco and ethical policy. Her typography and Christmas decorations are still made by woodcarvers from the same village rice farming community in Bali with whom she has worked from the very beginning. The farmers use this important secondary business to sustain their agriculture and cultivate fast growing albizia trees around their rice fields to provide the wood. Each piece is carefully cut out from a template, shaped by hand with a sharp knife, sanded down and if it is going to be painted or gilded, coated with a fine layer of plaster. They do not use MDF which produces dangerous carcinogenic dust when cut and aim for quality not quantity. Each letter is then packed by the carver in it's special box and shipped directly to the UK and posted to the customer in the same box to avoid wasteful double packing. 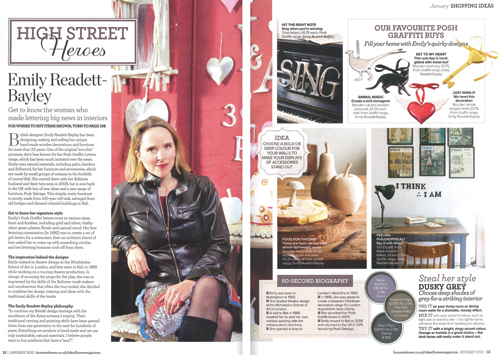 Emily was featured as an Ideal Home High Street Hero for being a pioneer in the use of lettering in interior design. Emily also produces Furniture and Accessories made from salvaged materials including rare, tropical hardwoods salvaged from old buildings and bridges. These were exhibited at Chelsea Flower Show for many years and can be purchased on Emily's own website emilyreadettbayley.com along with mirror frames made from old coffee trees, sago palm tableware and mother of pearl cutlery. 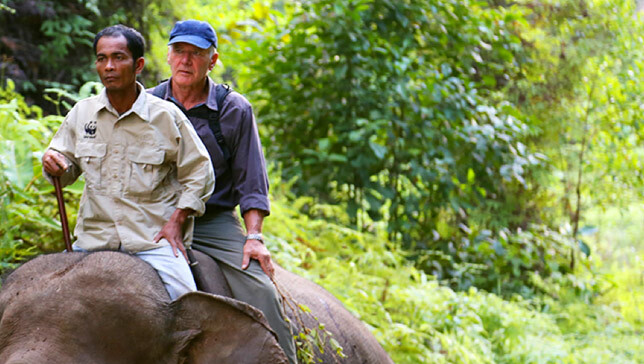 In 2012 Emily was invited to visit The Katingan Project an important rain forest protection initiative (ERC) in Central Kalimantan, Indonesian Borneo. She was asked if she would work with the indigenous Dayak villagers who live around the protected forest area. Her role was to design and market products that utilized the many sustainable natural resources available to deter people from plundering the forest for illegal hardwoods and endangered species. Emily noted in particular the potential to develop the traditional cottage rattan industry. In 2013 she launched operation PLANET BASKET and by pure chance sold half of the first container load of rattan baskets to a film production company based at Pinewood studios. They can be seen in all their glory in the opening scene of Star Wars 7! They were the first rattan products ever to be shipped direct from the Borneo jungle to Europe without going via a factory in Java or China. The Katingan Project — which caught the eye of Harrison Ford — pairs a basket-making business with the Indonesian government’s efforts to restore valuable land, employing local villagers along the way. Emily’s designs have sold to a wide variety of people and places around the world including : Bergdorf Goodman NYC, The Conran Shop, Chatsworth House, Gallerie Lafayette, Harrods, John Lewis, Jamie Oliver, Kelly Hoppen, Linley, Liberty, Neiman Marcus USA, The National Portrait Gallery, Nina Campbell, Nigella Lawson and The WWF. Emily studied Theatre design at Wimbledon School of Art in London. In 1989 she visited Indonesia with a British theatre company who were sourcing and rehearsing in Bali. Commissioning wooden masks and props Emily noted the unique skills and beautiful natural materials used and encouraged by the people she met decided to explore further the opportunity to combine her own design ideas and knowledge of the London Theatre and Arts with the traditional skills in evidence. Emily opened her first shop in Neals Yard, Covent Garden in 1991 and she had Pop-Up Shops on the edge of Soho throughout the 90’s. She first showed her designs to the trade at London’s Top Drawer Exhibition in 1997, was accepted to exhibit as part of Scenes d' Interieur at Maison et Objet in Paris in 1998 and went on to exhibit in Tokyo, Frankfurt and Milan. Today Emily continues to run her design and manufacturing company Emily Readett-Bayley Ltd with a focus on her work in the Indonesian rainforests. She still supplies POSH Graffiti with their lettering but no longer runs the website. It is now under new management run by Jason Weatherbed who has a background in typography. He aims to widen the graffiti theme so watch out for some exciting new products.